A Living Documentary is a comedic, no-nonsense reflection on the trials and tribulations of earning a living as a professional theater artist in the 21st century. Intertwining elements of musical comedy, documentary, and fiction, Hopkins’ newest work intersperses autobiographical storytelling with portrayals of semi-fictional comedic characters, all the while asking myriad questions about the realities of artistic life in New York City. A veritable departure from her past works, A Living Documentary presents a stripped-down, one-woman-show, in which Hopkins plays both herself and an eclectic cast of characters. 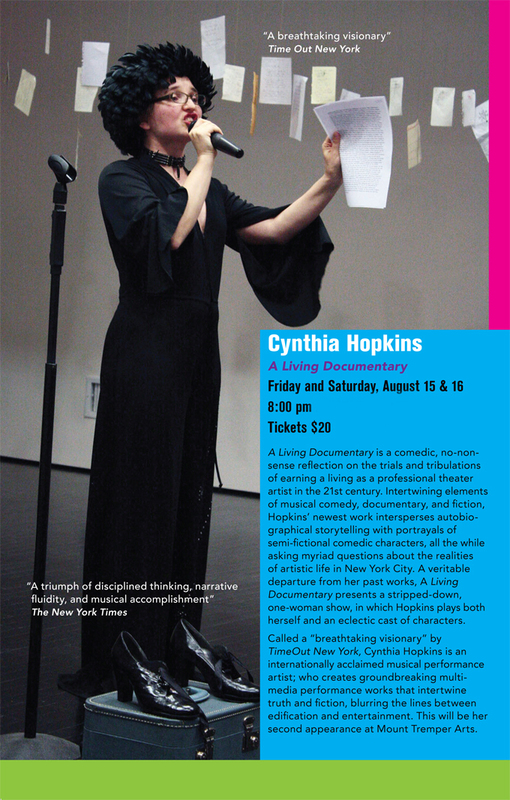 Called a “breathtaking visionary” by TimeOut New York, Cynthia Hopkins is an internationally acclaimed musical performance artist creating groundbreaking multi-media performance works that intertwine truth and fiction, blurring the lines between edification and entertainment. This will be her second appearance at Mount Tremper Arts. A Living Documentary was commissioned by New York Live Arts and made possible, in part, by the National Endowment for the Arts. A Living Documentary was developed, in part, through residencies at The Watermill Center (in partnership with New York Live Arts); Bunker in Slovenia (through the Suitcase Fund); and Mount Tremper Arts. Photo by Tom Kochie © The Watermill Center.